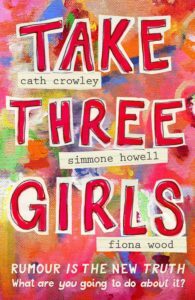 Take Three Girls is the collaborative effort of YA writers Cath Crowley, Fiona Wood and Simone Howell. It follows the lives of three boarding school girls as they find themselves under attack from a cyber bullying presence and form an unlikely friendship. `The novel covers all the intricacies of female friendships in a way that is too often overlooked in young adult books. It brings attention to fake friends and the dangers of competing with other girls so much that you lose sight of yourself, but it also celebrates the beauty of having friends who accept every part of you and support you when things look bleak. The three protagonists have strong, well-defined voices that really helps to break the perception that all teenaged girls are a hivemind. Each girl has their own struggles that are handled tactfullyand gracefully intertwine with each other to form a complete narrative rather than three separate stories. The love and friendship that the three girls show each other is a breath of fresh air compared to the typical female friendships in fiction, which usually revolve around men. Though Clem, Ady and Kate all have different interests, they embrace their differences and show each other unconditional love as they struggle through year 10. Take Three Girls encourages us to look past the stereotypes we inadvertently place on people and find the good within them. It warns us of jealousy and the risks that come with first love. The girls face pressure from all sources, including their so-called friends, their family, their teachers and their partners, but by staying true to themselves they are able to help each other survive their hardships. The message of the novel is overwhelmingly positive. It’s an honest and vulnerable portrayal of high school, friendship and family life, and it doesn’t shy away from sensitive topics like body issues, sexuality and substance abuse. It’s a reminder that in this digital age the ability to hurt people is more powerful than ever, but the ability to ease that pain and turn a bad experience into something positive is much more important. Posted in Book Review and tagged book review, bullying, collaboration, friendship, high school, teenage.